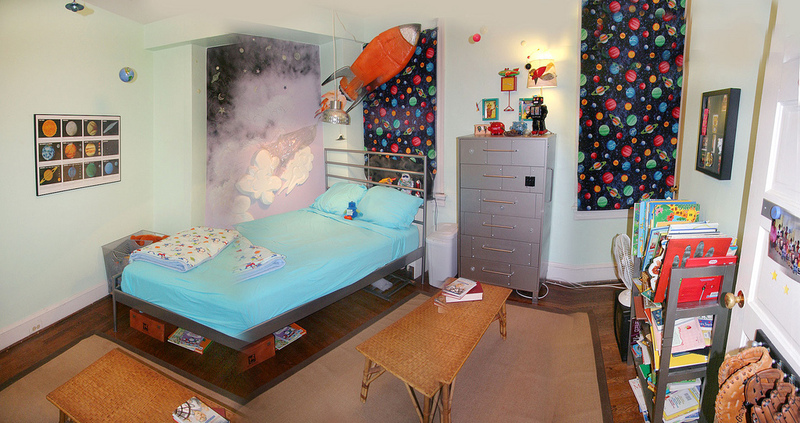 Decorating a boy's room isn't always that easy as they have very definite ideas on what they want. Make it easier on both you and your little one by having a few ideas to hand that you can suggest to him. While the obvious color choice for a boy's nursery is blue, your little tikes might demand something different when they get older in terms of color decorating ideas. For boys rooms however, you don't have to give the room a complete makeover, making use of a plain blue painted wall, is not such a bad idea for many reasons. It can be used as a "sky" wall, as "water" for a pirate room, as a great match for Thomas the Tank Engine, a general background for paint techniques, or left plain and with pictures and posters added, to create a boy's theme. Green works very well in a boy's room for many of the same reasons - you can use it as a "grass" background, a general background, or as a great match to boys favorites such as Ben 10. Red is also a great color for a boy's room, as it is bright and appealing, but not too girlie - it also goes very well with blue, and green, if you want to incorporate an accent wall and use more than one color. Yellow used in blocks of color also works really well. Colors to stay away from would be the obvious pink, and anything that is too light. If you wanted to use a more neutral color on the walls, then divide your walls into two, and use a darker color along the bottom, and a cream or white on the top half of the wall - this to prevent scuff and scratch marks from appearing so obvious. In terms of pattern, blocks of color are ideal, as are broad stripes, or a checkerboard effect. Many of these themes also work well as ideas for a kids bathroom, again using a plain blue or green background, with added wall murals, wall decals, or a painted stencil if you aren't feeling brave. The use of large pictures, groups of pictures, or posters are also great ways to incorporate the idea of a theme into a boy's room. You can then add finishing touches such as displaying relevant toys such as toy pirate ships, space rockets, or a cowboy hat and hobby horse. 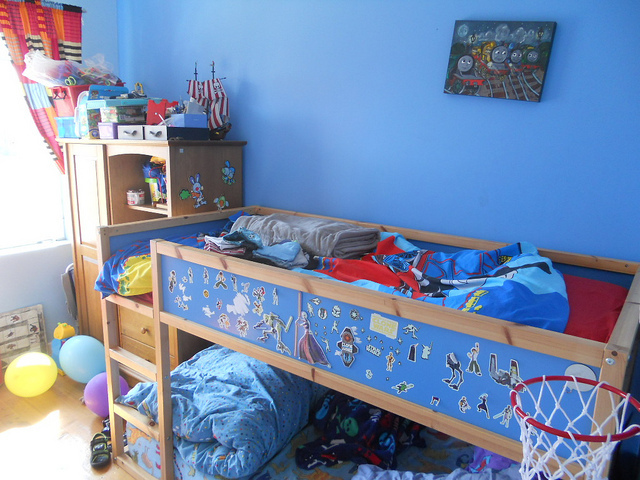 Above all else, furniture in a boy's bedroom should be sturdy and hardwearing - where possible it should also perform a dual purpose. 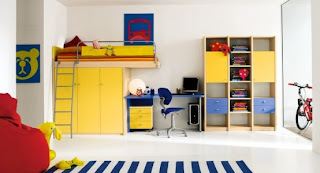 Cabin beds (or captain beds), that have built in storage underneath the bed, or even a desk, is especially good in a boys room, as are storage units that have seating on top. Large wooden furniture with a natural finish, or completed in a primary color, or one that complements the room's decor also works well. Metal furniture, such as bookshelves, adds some authenticity especially to a space themed room, but you should obviously take care of rough edges around small children. Decorating ideas for boys rooms needn't be anything more than a block color background in striking colors, wooden furniture, and the addition of relevant toys and pictures to incorporate a theme, or you can go to town with detailed themed murals and matching bedlinen - it's all about what works for you and keeps your boys happy.